What Is The Revised Hazard Communication Standard And How Does It Relate To Translation And Interpreting? It seems a no-brainer that companies with employees that speak other languages would want to provide safety information and warnings to those employees in a language they understand to protect both themselves and their workers. Further, OSHA (Occupational Safety and Health Administration) has revised the Hazard Communication Standard (HCS)to improve safety, standardize hazard information and eliminate confusion. Under the Hazard Communication Standard, employers must inform workers of all toxic and hazardous substances in the workplace. HCS guarantees workers the right to know what hazardous chemicals they work with and near. It also guarantees that workers have access to all related Safety Data Sheets (SDS)—formerly Material Safety Data Sheets (MSDS). US Secretary of Labor Hilda Solis has said that “exposure to hazardous chemicals is one of the most serious threats facing American workers today.” This is why OSHA revised the HCS to improve the quality, safety and consistency of the standard. The revised Hazard Communication Standard modifies the existing standard and aligns it with the Globally Harmonized System of Classification and Labeling of Chemicals (GHS) so companies can easier understand and comply with regulations and reduce trade barriers. OSHA estimates that the revised Hazard Communication Standard will affect 43 million employees that may be exposed to hazardous chemicals at more than 5 million workplaces in the United States alone. What Is The Revised Hazard Communication Standard? The revised Hazard Communication Standard (HazCom 2012) requires employers disclose toxic and hazardous substances, to provide employees with unrestricted access to Safety Data Sheets (formerly referred to as Material Safety Data Sheets), and to provide health and safety training so employees understand risks. The revised HCS is established in 29 CFR 1910.1200. Under HCS, chemical manufacturers and importers must evaluate the chemicals and associated hazards and prepare suitable labels and Safety Data Sheets. Additionally, employers must use labels and make SDS available to employees and train all exposed workers to understand the labels, SDSs and how to work with the related chemicals. The revised Hazard Communication Standard guarantees workers access to SDS sheets and information on toxic and hazardous substances because this information is required by doctors to be able to medically diagnose and treat illnesses related to exposure to such toxic and hazardous substances. For the most part the revised HCS does not make major changes, but rather just modifies the current HCS to bring it into compliance with GHS. While the revised HCS regulations do not explicitly say you must translate your materials, they do mention four times that organizations with speakers of other languages may provide HCS materials in other languages. Having employees that speak other languages is an important consideration when creating Safety Data Sheets, labels and training materials for your Hazard Communication program. For example, if all your employees speak only Spanish or Tagalog then providing notifications in English is not sufficient. Translating HCS materials provides additional safety precautions and protects workers that handle hazardous substances and organizations from liability from any accidents that may occur due to misunderstanding this information. Interpreting is also recommended for communicating the Hazard Communication Standard to non-English speaking individuals. In the revised Hazard Communication Standard, OSHA requires employers to train employees to be able to identify and understand the new labels and Safety Data Sheets and other information related to the HCS. Trainings are to be given by December 2013, and two years after the final revised HCS rule is published and once again by June 2016. For employees that speak another language and have limited English proficiency (LEP), these trainings should be given in their native language(s). This can be done by using a native language trainer, or through the use of a professional interpreter. Interpreters should also be used to facilitate communication in the event of any incidents regarding hazardous materials. Who Oversees The Hazard Communication Standards? The Hazard Communication Standard was established by the Occupational Safety and Health Administration (OSHA). Canada uses the Workplace Hazardous Materials Information System, and the European Union uses the European Agency for Safety and Health at Work. OSHA requires importers and chemical manufacturers to assess the hazards of the chemicals they manage and to properly apply labels and create appropriate safety data sheets to communicate these hazards and accompanying information. OSHA also requires employers to make labels and safety data sheets available to exposed workers and to train them in proper chemical handling. Full compliance with the revised Hazard Communication Standard must be in effect by 2015. By December 1, 2013, employers are required to train workers on the new labels and Safety Data Sheet format to ensure that all exposed employees can recognize and understand the labels and procedures. This training must be complete by December 1, 2013 to make provisions for new labels and Safety Data Sheets that may be encountered before the law goes into full effect. The revised HCS also mandates that all workers be retrained by two years after the final rule is published. On June 1, 2015, the EU will implement their classification of mixtures. By December 1, 2015, all chemical manufacturers, importers, distributors and employers must comply with the revised Hazard Communication Standard. However, distributors cannot ship containers with the chemical manufacturer’s label, except if it is a GHS label. By June 1, 2016, employers must update their workplace labels and hazard communication programs. By this date employers must also give employees additional training on newly identified physical or health standards. While the revised Hazard Communication Standard is being phased in, organizations and employers must comply with the current HCS or the revised HCS or both. During this transition, there may be labels and Safety Data Sheets that are under both standards within the same workplace. When the revised Hazard Communication Standard goes into effect, all labels for a chemical must be updated within six months of when manufacturers, importers, distributors or employers become aware of new information regarding that chemical. In keeping with Global Harmonization Standards that the United Nations revises every two years, the revised Hazard Communication Standard will follow these GHS updates and be updated consistently. The revised HCS will increase health and safety and will reduce the number of accidents, injuries and fatalities due to exposure to hazardous chemicals. OSHA estimates that it will save $250 million a year and prevent 43 fatalities, 585 injuries and 318 non-lost workday injuries, 203 lost-workday injuries and 64 chronic illnesses each year. The revised HCS standards will eliminate confusion that comes from the many and varied local, national and international regulations and requirements for managing hazardous chemicals. It helps users quickly and efficiently find and understand hazard information and keeps that information consistent across all countries and locations. OSHA has stated that the revised HCS will save approximately $475 million in productivity improvements, $32 million in label and SDS updates and $285 million in simplifying hazardous communication safety trainings. 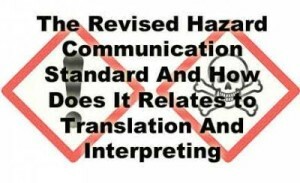 Click here for a more in-depth review of the revised Hazard Communication Standard and to review Language Scientific’s HCS translation and interpreting services. Please leave comments or questions about the revised Hazard Communication Standard in our comments section below and like and share this blog with your network.